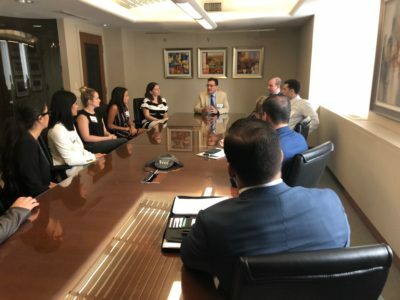 First-year students at Roger Williams University School of Law recently toured the offices of Higgins, Cavanagh & Cooney and heard from the firm’s associates who also graduated from the same institution. The visit was intended to provide an early introduction to law and practice as the students were about to embark on their legal studies. The students received a great deal of helpful advice from Kristina I. Hultman, J. David Freel, Larissa B. DeLisi, Kurt A. Rocha, and Kelsey Peck, a Roger Williams University School of Law student and HCC law clerk. HCC partner James A. Ruggieri, who serves on the Board of Directors for Roger Williams University School of Law, directed the lively discussion. Students were advised as to the excellent foundation that their education would provide for a career in the law. The importance of taking full advantage of writing and research opportunities either though law Review or moot court competitions was emphasized. The value of judicial internships and law firm clerkships was stressed. Registering for courses that would ultimately be covered on the bar exam was also mentioned as was attending classes taught by the law school’s suburb adjunct faculty, which is comprised of well-respected practitioners and judges. A tour of the firm’s offices followed. The law students were accompanied by Professor Colleen Brown, who teaches legal practice at Roger Williams University School of Law.